Each year, in the United States alone, hundreds of thousands of dogs are euthanized in shelters, many of whom never even had a chance at adoption. In order to make room for dogs who are deemed more easily adoptable, animal shelters will often immediately put down any stray or surrendered dogs with health issues or disabilities. And while more and more rescue groups specialized in saving these “unadoptable” dogs are popping up across the U.S. and Canada, there’s one special group of volunteers and foster families that are focused solely on pulling blind or visually impaired dogs from high-kill shelters. Since 2009, The Blind Dog Rescue Alliance, a nonprofit 501(c)(3), has rescued more than 500 dogs from shelters and other at-risk situations. The group has an impressive network of approximately 100 active and dedicated volunteers in the United States and in Canada (and one in New Zealand!) who work together to identify and remove blind dogs from life-threatening environments and provide financial support to foster families. 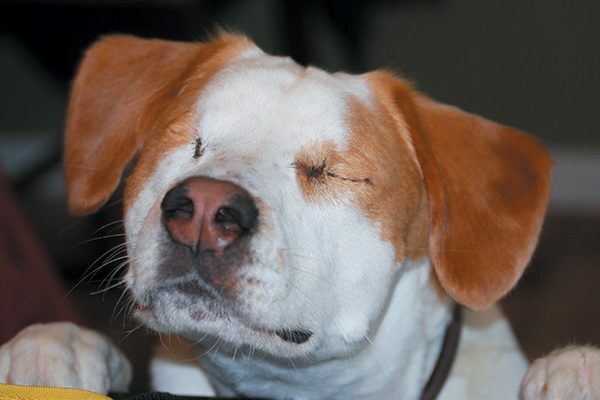 What Cherie wants people to know is that blind and visually impaired dogs are just like other dogs and love to play with toys, run around, cuddle and get excited to meet their owners at the door. She explains that along with training the dog to know commands that could save her in an emergency while also establishing trust between the dog and her owner, many dogs acclimate very well to blindness and can map out familiar spaces to navigate without bumping into anything. As such, potential adopters shouldn’t be afraid of welcoming a blind or visually impaired animal into their home, and BDRA has successfully adopted out many wonderful dogs into loving homes who would have certainly never had a chance in a shelter. Pete is a dog who has been saved through BDRA. Photography by Jim McCarron | Courtesy The Blind Dog Rescue Alliance. 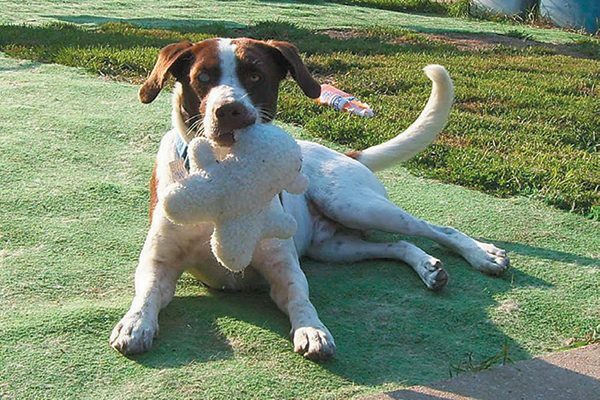 Dogs like Pete, who was found along a highway in South Carolina with buckshots to the face. Pete had to have both his eyes removed, but his story has a happy ending, as this spunky dog who can climb and run up and down stairs was nursed back to health and eventually adopted by his BDRA foster mom. For other dogs with particular health or behavioral issues, as well as senior animals, BDRA runs a program to keep them as “furever fosters” in order to provide them with the love and specialized care they need for the time they have. Quinn is a crowd favorite at BDRA events. Photography by Jim McCarron | Courtesy The Blind Dog Rescue Alliance. Quinn the Pit Bull is one of these dogs who is spoiled with attention from her furever foster mom. Quinn came to BDRA after being found on a Craigslist ad (“very often a death sentence for any dog,” according to Cherie). She’s totally blind and only has a partial brain due to hydrocephalus. 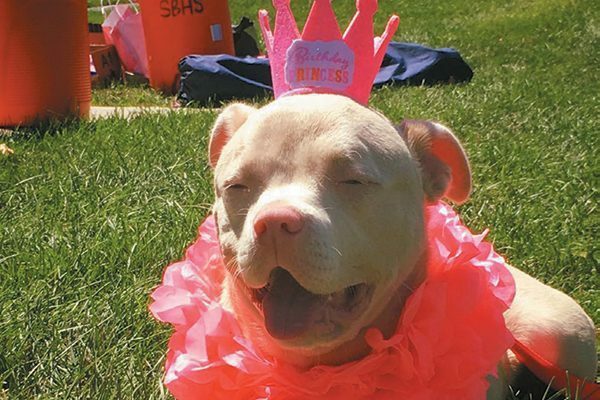 Thanks to the dedication and loving commitment of her foster family, Quinn, the medical miracle, has defied all odds and is a happy girl and crowd favorite at BDRA events. In some cases, BDRA will work closely with owners of blind or visually impaired dogs who can no longer care for them in order to rehome their pets. 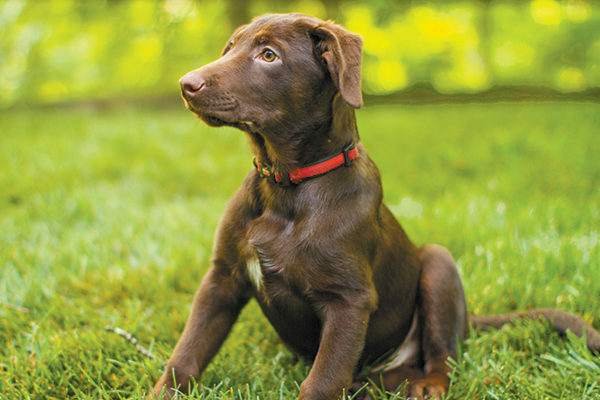 In this way, the owners keep their dogs at home in the time it takes for a new home to be found, and the dogs don’t have to first be fostered by someone new and then later adopted by another new person. For Cherie, bringing support and awareness to people about the unique needs and qualities of blind dogs is part of BDRA’s mission. Plus, Meet BDRA’s Very First Rescue Dog! Adam, BDRA’s very first rescue dog! Photography courtesy Cheri Masino. In August of 2009, a 6-year-old brown-and-white dog named Tex was awaiting imminent euthanasia at the Spalding County Animal Shelter in Georgia on a Monday morning at 9 a.m. When BDRA checked the shelter’s website on Sunday and saw that Tex was no longer listed, they feared the worst. But Tex — now known as Adam — was very much alive, and Cheri, a BDRA volunteer in Wisconsin offered to foster him just 30 minutes before his euthanasia deadline. Adam was ill with lungworm, but Cheri nursed him back to health, and he was later adopted. Today Adam is happy and healthy and even has a sister adopted from BDRA. The Blind Dog Rescue Alliance is looking to extend its volunteer network, particularly in the western half of the U.S. and in Canada. For more information, visit blinddogrescue.org.